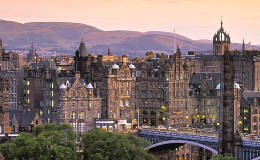 Book your private tour in Edinburgh at affordable prices! Welcome to the capital of Scotland! Here you will find a friendly and busy city with plenty of cultural activities, monuments and unique leisure to fit all tastes. Here at Capital Cars, we don’t want you to miss anything Edinburgh has to offer, so why not have a relaxing day in one of our air-conditioned people carriers and explore this beautiful and historic city? We will pick you up at your hotel and take you on a leisurely drive past Calton Hill and the Burns Monument before arriving at Holyrood Palace and the Scottish Parliament Building. As we enter Holyrood Park, we will go on the Radical Road up the extinct volcano of Arthur’s Seat to get panoramic views of the city and the Firth of Forth and the shore. As we leave the park past Duddingston Kirk and the famous Sheep’s Heid pub, we head to the 15th century Craigmillar Castle and then on to the stunning Roslin’s Chapel. From there we will visit the stately Hopetoun House before arriving at the world renowned Forth Rail Bridge. As we drive along the river, you will have the chance to board the Royal Yacht Britannia and stroll through the Royal Botanic Gardens. Our panoramic tour is the most comfortable option for groups of up to eight people looking for a private and relaxing time while discovering the unmissable landmarks in Edinburgh. Let the locals show you the best spots in the city, book your tour with Capital Cars today!